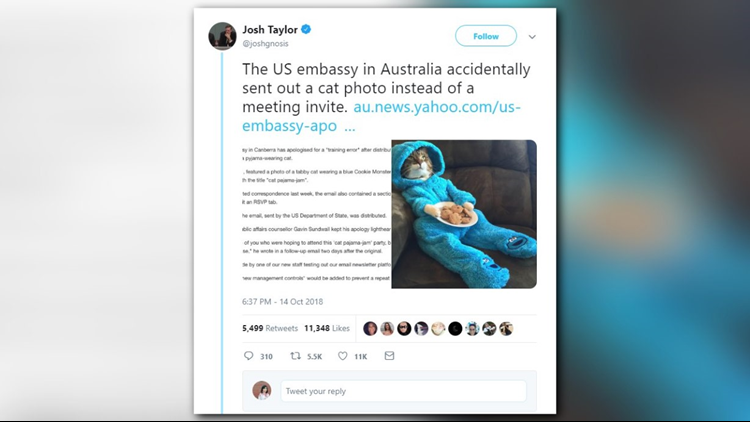 The U.S. Embassy in Canberra, Australia apologized for a "training error" after a fake meeting invitation featuring a cat wearing a Cookie Monster costume was sent out, according to the Australian Associated Press. The email was sent by the U.S. state department, but the embassy apologized on its behalf. Recipients of the email, titled "meeting," had the option to RSVP to an event called "cat pajama-jam," which featured a photo of a cat sitting on a couch wearing a Cookie Monster costume and holding a plate of cookies. US Mission to Australia public affairs counselor said that the error was made by a new staff member testing the email newsletter platform. Perhaps what the embassy should have apologized for was not hosting a "cat pajama-jam." Twitter users expressed their disappointment that it wasn't a real event. As for the cat that started it all, he appears to belong to an Australian woman, who often posts photos of her pets on Instagram. She responded to the apology with a photo of Joey the cat in his Cookie Monster costume. "Joey's upset that the cat pajama-jam won't be happening," the post said.